We’re excited to introduce a new volunteer engagement opportunity through our Team Builder program for business groups: The Playhouse Experience. Having a safe place to play is important for every child. 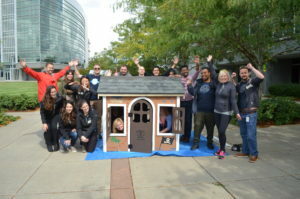 That’s why the Playhouse Experience invites teams of volunteers to assemble and decorate children’s playhouses, which are then donated to families through our partner nonprofit, The Dougy Center. Volunteers can show off their creativity by decorating each playhouse to fit the fun theme chosen by the recipient family. After working together on tasks like attaching trim and shingling the roof, your team will have a beautiful finished product to benefit a great cause. Through volunteer feedback, we designed experiences that offer flexible hours and locations, with the option of bringing the event right to your company’s doorstep. The donations for these fun and unique experiences go directly toward helping families in need of a decent place to live. Limited slots are available—schedule now!